QuickBooks® clients often need to void checks that were written in a prior period. However, prior period income and expenses should not be changed for various reasons such as tax returns having been prepared. The usual option is Void Check under the Edit menu. However, this takes the original transaction and changes the amount to $0. The date of the transaction is the date the change of the dollar amount of the transaction will be effective. To prevent a change to the prior year accounting data, the voiding of a prior period check in the current period requires the entry of a deposit for the check that is to be voided. 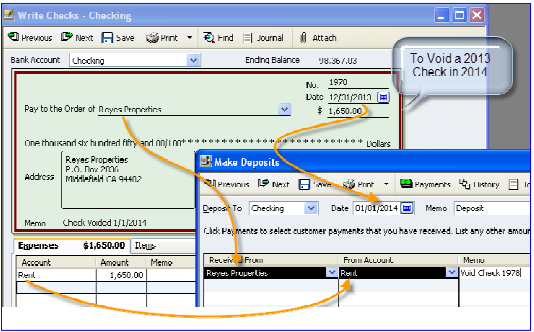 During the bank reconciliation process, the check to be voided and the deposit are both cleared. The memo field on both the check and the deposit should reference the voided check. This will successfully void the check in the subsequent period. Differing From Accounts may want to be used on the Deposit depending on the reason for the voided check.